The live video streaming application Qik has just been approved in the App Store and should be available shortly, we’ve learned. The company submitted the app a couple weeks ago following the approval of Ustream’s live streaming application, and as expected, Apple also had no problem with it now. This marks a change from Apple, which previously was blocking all apps that did live video (recording) streaming. Apparently, the way these streaming apps work is using a restricted API (a screen capture API) to get around the fact that Apple doesn’t grant them access to the video APIs for live capture and streaming. But Apple has suggested that it will no longer enforce protecting this API and in the future should open more that allow for live video streaming. Also interesting will be AT&T’s reaction to this and other apps like it. Though they’re unlikely to say anything in defiance of Apple, they can’t like the idea of live streaming video apps being approved en masse. AT&T has indicated in recent weeks that that massive use of data on the iPhone was an issue that was leading to data degradation. Note: While Qik has had an iPhone app available in the App Store for a while, it previously did not allow you to live stream from your phone. This new version will. There was also previously an ad-hoc version of the app, but that method of distribution was very limited. Again, look for the new version shortly. Update: I’m told that the latest live streaming version of the app will be called “Qik Live” when it’s available in the store. 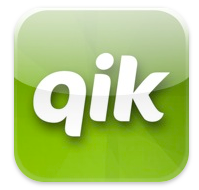 The old “Qik for iPhone 3GS” will remain available too.